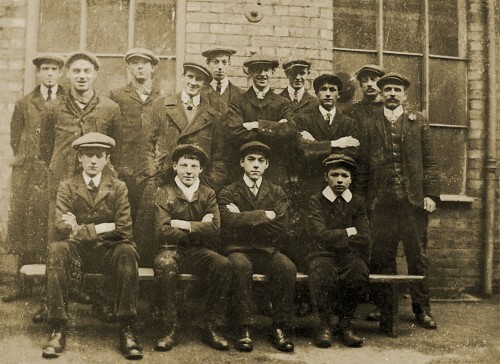 This photograph was taken outside Wright’s factory, probably just before WW1, or possibly just after. Sixth from the left, on the back row is Benjamin Williams. The 1911 census shows him living with his parents, Israel and Frances Williams and siblings Leonard, Emily, Henry, Franklin and Rowland, on Barrow Road. Emily, Franklin, Rowland and Benjamin were all employed by Wrights. The three boys sitting down on the right look very young to us today, to be employed in a factory. This photograph was kindly lent to the museum by Rowland’s niece, Jessie Long.